Over the weekend I cooked 3 recipes from my magazine clippings...something I wouldn't have done without ripping out pages from my magazines. Reading the ingredients and looking at the beautiful photography got me inspired. The three I picked were delicious and were a treat visually too. I plan to share them with you soon....but today we're talking tomatoes. I made the two pictured above this morning. The larger one was made from a 8" x 4" bias rectangle. The smaller one was cut 6" x 3". I filled both with crushed walnut shells. (bird litter from the pet store) I love the weight that the crushed walnut shells give to a pincushion. The walnut shells don't have much "give" to them. Do you think these look like tomatoes or pumpkins? The larger one looks a bit like a pumpkin shape to me. I used pearl cotton and pulled it tightly....still not much definition. I'm going to purchase some wool roving and try using it and compare the results. What do you use? I use poly fiberfill. I would use wool roving if I could find it and it was reasonable. The natural oil in the wool is good for your pins and needles. I use the wool "snippets" from my rug hooking. I've also tried the cotton stuffing, but think that's too hard for a pincushion. I've used both wool roving and polyfill. I prefer the wool roving because as Melody said above the natural oil is great for your pins and needles. For the polyfill, I've wrapped it up in a nylon stocking cut to size -helps to give a good shape to it. I love tearing recipes out of magazines. I put them in those page protectors that are like a clear pocket that hold a standard size sheet of paper. I sort them by category and put in the folders that have an inside pocket on each side. I LOVE those tomatoes (& I think they LOOK like tomatoes--lol). Hope you'll tell us how to make them. I've never made a pincushion so wouldn't know what to use for the stuffing. Heirloom tomatoes come in all colours, shapes and sizes and your's look lovely. Thanks for the tip on where to get the walnut shells. I was scratching my head about that. Your tomatoes like nice. Here is a link to MS's "Homegrown Tomato" pincushions. tomatoes and darn cute ones at that!! Alma, they look like tomatoes to me, and I love the vintage way they look.......I use cotton batting and walnut shells too. I am looking forward to hearing more about the 3 receipes. I had hoped to come to your retreat in MN, but it just didn't work out for me. I know a couple people who are going and they are really looking forward to it. I'm sure it will be as great as some of your others that I have been to. Maybe I will make it to one this summer! I use crushed walnut shells. I used to use poly-fil but they didn't have enough weight. Sometimes I combine the two if I want the weight but also need a little "pouf" or extra shaping. I wouldn't even attempt to make one but I'd buy yours if I saw them in a store! Nice tomatoes! I wouldn't have a clue how to make them. I'm like Terri - I would just buy them! lol! Alma, everything you make is wonderful. I wouldn't change a thing! I use fiberfill for 3/4s of the filling then fill the bottom 1/4 with walnut shells.. adds weight and keeps it upright. The fiberfill I stuff until I can't get my finger in any more then use a tiny funnel for the walnut shells. I have a lot of vegetable patterns, need to sit down and make some. I use stuffing and my wool snippets, depends on the look and feel, that I want. They both look like tomatoes to me, and they are both beautiful! If you saw the shape that some of my tomatoes grow in you would say yours were fine, my real ones leave a lot to be desired though. I use 1/3 teddy pellets for weight then fibrefill and dried lavender. I find that the dried lavender still has a small amount of oil in it so each time I put in a pin I can guarantee that there will be no rusting and the added bonus is the subtle scent too. I use poly fiberfill but I might try using my wool scraps if I make another one. I do not own a Tomato (pumpkin) cushion. I just might need one. Enjoy all of your cooking. I love the crushed walnuts. I've mixed cotton filling and walnuts and like that too- weighty but with a little more give. Alma, when I make tomato pincushions I sew together two circles rather than rectangles. You can make them by using your different size plates to draw the circle. I like a 4 or 5 inch plate for the small ones. But I also use the crushed walnut shells. They make the best filler and the tomatoes will be flat and squish-y. I use scraps of batting and bits of roving or wool from rug hooking...not a very scientific mix! Last year I tried to make a new recipe every weekend and was pretty good about keeping up with it. This year we have gone to two days a week not using meat - which almost has me finding a new recipe each week! Pumpkins, definitely pumpkins. But cute pumpkins! Use a combo of thin batting on the inside of the fabric, then fill with the walnut shells. This will prevent any sharp points on the shells from piercing the fabrics later on. fooled me i thought these were from when you went shopping the last time you got hooked on tomatoes! In my eyes they look wonderful, i do like emery but know it can be costly. I use pure wool stuffing and I purchase them from doll maker Gail Wilson. They are really nice quality and at very reasonable price. I had pages and pages of ripped out recipes. I scanned them all and now have them on my computer...pictures and all. With Vista or 7, organizing pictures, scans, etc, is incredibly easy. I spend a lot of time on my computer, so it is very easy to look thru recipes at any time. Any idea when you will have your project posted for Primitives of the Midwest? I think the two tomatoes look terrific! Can't help with those cause I've never made any but wanted to let you know I got "Honeysuckle Manor" and love all the patterns! You ladies are sooooo creative. I just love the tomatoes. I am going to get together some fabric and try to make some of my own. I really like using the crushed walnut shells for stufing. --I recently discovered this blog. Now it's one of my favorite places to go when I need a little stress relief during the day. I love looking at the projects and getting inspired for my own. . . . Now I'm going to have to start looking for crushed walnut shells--what a good idea. I recently found this blog and it's now one of my favorite stops on the web. Thanks for all the good ideas. I'm off to look for crushed walnut shells . . .
Hi Alma, Is there any chance that the last chapter of the Loose Feathers Club will be finished soon? Seems like forever since I received the first chapter in 09 and I'm still waiting for chapter 6 to finish out the year. Also, has March's Anniversary of the Heart made it to the printer yet? I know all work and no play makes for a dull person, but us stitchers are waiting to continue our stitch alongs. I love your tomatoes! Thanks for the info on how to make them. I envision a nice glass jar filled with different tomatoes, but of course haven't made one yet. ;) I know you like to read... you should read "The Story Sisters" by Alice Hoffman. One of the characters plants a variety of heirloom tomatoes, from purple to red to every color in between. It was an interesting aside to a good story. Enjoy your weekend! 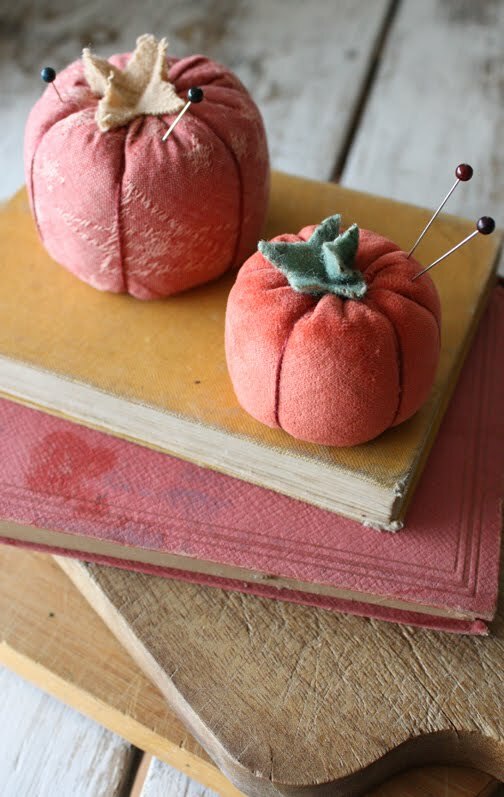 When I was young, the Tomato pincushions must have been cheaper than needles, because my grandmother would buy a new one and let me take the old one apart to rescue the needles that made their way inside. They were always filled with a fine sawdust. I think a layer of fiberfill over the fabric and then walnut shells would make the shape smoother. out! Any idea when it will hit the stores? Keep up the great work! Hello, I have just discovered your blog and I love it! I have 2 jelly rolls of Beach House and I am ready to start cutting pieces of your lovely quilt. My question is: what king of batting do you use for your quilt? It looks so cozy almost like an antique quilt in the picture? I love your tomatoes! I love your fabric. Show us more. I love your beautiful tomatoes (smile). I always stuff my pin cushions with raw wool (still greasey). I live in a sheep farm district and so greasey wool is in abundance for me. I read many, many years ago that the lanolin in the raw wool would prevent rust in your pins and I'm pleased to say that I haven't had a rusty pin in the 20 years I've been using these cushions.